In A University Education, former Minister of State for Universities and Science (2010-14) David Willetts sets out the changes he fostered during his four-year ministry and his views on what still needs to be transformed, alongside a scholarly appreciation of how the current higher education system and its particularly British (mainly English) features have evolved. In this review, Ron Johnston critically considers Willetts’s conception of the nature and role of universities in contemporary Britain. Earlier this week David Willetts and LSE Professor Paul Dolan debated the question “Is Higher Education Good for You?“, and the podcast from that event is now available to listen to and download. This event was part of LSE Festival: Beveridge 2.0, a week of public engagement activities exploring the “Five Giants” identified by Beveridge in his 1942 report in a global 21st-century context. A University Education. David Willetts. Oxford University Press. 2017. Universities are frequently in the news these days, but rarely for the really big issues facing them; the personalised campaign by some senior politicians against Vice-Chancellors’ salaries (bloated though some might be), enthusiastically taken up by the media, diverts attention from more serious concerns. These have instead been brought into focus by a 2017 National Audit Office report on the higher education market, highlighting issues such as the information available to prospective students when deciding whether to enter higher education and, if so, where and what to study; the level of consumer protection students have compared to buyers of services in other markets; the low proportion of students from relatively disadvantaged backgrounds and the standing of the institutions they select; the lack of price competition between institutions; and the lack of market incentives for institutions to compete on course quality as well as the little influence that students have on this. Furthermore, in a survey quoted in the report, only one third of current full-time English undergraduates rated their courses as providing value for money. Key to these criticisms is the final word of that report’s title: “market”. Successive ministers responsible for higher education have sought to press universities further into a market-based structure, whereby higher education institutions must compete for students on the basis of the skills they can inculcate and prepare them for well-paid jobs that meet society’s economic needs. In that competition to survive, universities will find it necessary to improve teaching and the learning experience. One such minister between 2010 and 2014 was David Willetts. As with most of his predecessors he claims to like universities and what they do, but unlike the majority, he clearly actually does. He wants universities to flourish with as many students as can benefit from their offerings doing so, and believes that this can only be achieved within a market discipline, which is currently weak. A University Education promotes Willett’s cause and lauds the changes made by the Coalition government in which he served, while not being unaware of some of its failings. 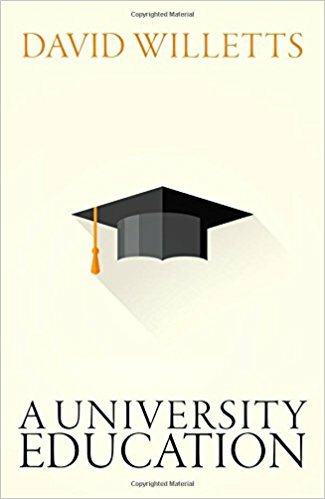 This is set in a well-researched context: the early chapters provide an excellent brief introductory appreciation of the history of university education (though he says nothing about the honours degree system, unlike many others he is correct about the Robbins report in noting that it did not create the new universities of the 1960s). The discussion of current policies and outstanding issues is similarly based on detailed research, quoting a wide range of academic evidence – some of this is intriguing, as with his assembling of evidence on the returns from investment at different stages of the education system (Chapter Six) and his linkage of life expectancy with attending university to show that those years are essentially “free time” rather than “income foregone” (124). In this sense, the book is a “good read”. Image credit: Pomp and Circumstance by Dave Herholz. This work is licensed under a CC BY-SA 2.0 license. But it is far from unbiased. Like so many contemporary critics, Willetts subscribes to the belief that British universities privilege research over teaching (suggesting an implicit contract with students – “we’ll give you a good grade to get you a decent job if you let us get on with our research”, p211). But he sets that criticism in its long-term context: the predominance of Oxbridge has led many (most?) newer institutions – when Oxbridge “allowed” them to be created – to focus on research, both institutionally and as the basis for individual academics’ career advancement. The funding system introduced from the 1980s onwards exacerbated the pro-research bias, providing extra income to universities that demonstrated research excellence but no similar incentives for teaching excellence (indeed, by capping student numbers, governments provided a disincentive). Willetts does not want to blunt British universities’ international reputation for research excellence (though he would like more of it to be “applied”), but he does want a change in the balance of emphasis between research and teaching so that students get a better deal. Furthermore, as he sees more of them attending universities as necessary to the country’s future, getting a better deal is also crucial to the nation’s continued economic success. One chapter – and other comments elsewhere – defends that funding system. Students’ fees are paid by the government when they enrol at a university and repayment, currently at an extortionate rate of interest, only occurs when they are earning more than a set annual income, and then only a small part of the debt each year. After 30 years the remaining debt is written off – which benefits low- and high-income earners more than those on medium incomes: a number of sources suggest that between 40-45 per cent will be written off. Willetts never fully addresses the real impact of this system on not only the future cost to the exchequer of writing off the debt (which will only begin in about 25 years’ time), but also the current cost of raising several billion pounds annually (either by tax or borrowing) to fund universities. Is it sustainable? Already by March 2017 the National Audit Office estimates the outstanding balance as £89 billion, and this can only increase massively. Willetts doesn’t accept that his funding system is not fit-for-long-term-purpose, but does admit one failing: he didn’t expect that universities would, with very few exceptions, all charge the initial annual £9,000 maximum for every course. They did, and this is unlikely to change – no university wants to admit that it is “cheaper” than its competitors (and therefore perhaps admit that its degrees are of lower quality), and none will forego the maximum possible income. So there is no price competition. Willetts admits that some courses, mainly in the STEM subjects, are more expensive than others to deliver, but the small amount of extra government grant funding for them does not cover the difference. In some universities, therefore, large science and engineering schools are being subsidised from fee income “earned” by the humanities and social sciences, stimulating increasing anger among students of those disciplines. Willetts recognises that this occurs, but not the reason why. In many ways, the best-off institutions under the present regime are those with little or no “big science”. Willetts wants more people to go to university to meet the needs of an increasingly information-driven economy and advocates much wider participation from society’s relatively disadvantaged strata. He wants there to be more, and better-informed, choice, higher quality teaching (which he occasionally equates with more hours in the “classroom” – I went to university to read for a degree!) and less early specialisation at secondary school as well as university. All of that is set in a market-based infrastructure where the emphasis is on training rather than learning, to be delivered by a wider range of institutions, including large, profit-making corporations increasingly deploying technology-based delivery systems. He regrets that neither the Open University nor the University of Buckingham became such bodies and sees merit in the North American companies that now compete in some markets (although one of the largest is reputed to spend more on advertising than teaching and has a very high drop-out rate). This programme therefore comes from an author largely sympathetic to universities but who, despite his many visits and his now visiting positions, writes as an outsider. Nothing in his book reflects on the demands and stresses on academics – many imposed by the bureaucracy needed to implement his and his predecessors’ changes. I went to university in 1959 and very little of what I experienced then characterises the institutions I have worked in over the last three decades. The pressures – on students as well as staff – are much greater. I recently read a book on how to be an “academic superhero” which stressed the importance of career planning and work-life balance – but have current academics the time to plan? It is a pity that Willetts didn’t reflect on the day-to-day nature of an academic’s life and how his scenario of the future will impact on that. And the proposed changes never end. His successor, Jo Johnson – and he is not the first – published detailed proposals for two-year degrees for which universities will receive less per student than for those doing three-year degrees. 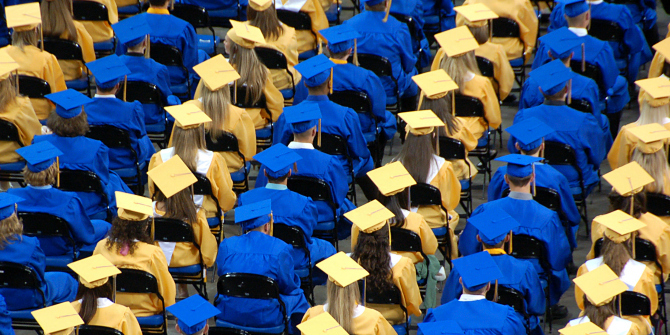 Universities will be pressed to adopt this scheme and do more, but with less resources. If ministers really believe in a market, then they shouldn’t constrain it. Furthermore, throughout the book, although he pays passing attention to universities’ cultural roles, Willetts presents a utilitarian programme (frequently countering the arguments of Stefan Collini and others). Nowhere does he recognise the important role of universities in holding society to account and developing students’ critical faculties. A University Education is a worthwhile read for all interested in British universities, in how they have got to their current situation (which Willetts’s historical appreciation clearly diagnoses) and how the present government sees their future. The Labour Party apparently envisages a very different one, but we await the detailed blueprint. Meanwhile, academics struggle to adapt to increased marketisation. Their teaching and research provide the basis of a rewarding career, and the great majority of students tell the National Student Survey that they are satisfied with their courses, but the pressures academics are under to deliver governments’ increasing demands probably mean that few will find the time to read Willetts’s book! Ron Johnston is a professor in the School of Geographical Sciences at the University of Bristol; before moving there in 1995 he was Vice-Chancellor of the University of Essex and before that a Pro-Vice-Chancellor at the University of Sheffield.